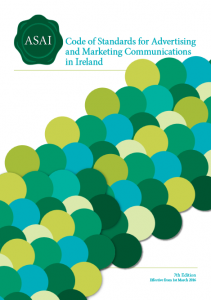 The changes to the Advertising Standards Authority of Ireland (ASAI) code of standards for advertising and marketing communications in Ireland come into force today, March 1st. Launched in September last year after a period of consultation, this is the 7th edition of the ASAI code, which for the first time now includes a set of rules for the advertising of vaping products. 17.2 For example, if an E-cigarette were to use a well-known tobacco label’s colouring together with font, this would be in breach of this code rule. 17.10 The concept of this rule is already used in the Alcohol Code rules. If a person who appears in an advertisement using an e-cigarette looks to the objective observer to be under 25, then this will be a breach of the Code, notwithstanding the fact that the actor/model is indeed over 25. A downloadable PDF of the full code is available on the ASAI website, and we would advise all Irish vendors, manufacturers and advertising professionals to become familiar with it. Marketing communications for e-cigarettes should be socially responsible. Marketing communications should not contain anything which promotes any design, imagery or logo style that might reasonably be associated in the audience’s mind with a tobacco brand. Marketing communications should contain nothing which promotes the use of a tobacco product or shows the use of a tobacco product in a positive light. This rule is not intended to prevent cigarette-like products being shown. Marketing communications should make clear that the product is an e-cigarette and not a tobacco product. Marketing communications should not contain health or medicinal claims unless the product is authorised for those purposes by the HPRA. E-cigarettes may be presented as an alternative to tobacco but advertisers should do nothing to undermine the message that quitting tobacco use is the best option for health. Advertisers should not use health professionals or celebrities to endorse electronic cigarettes. Marketing communications should state clearly if the product contains nicotine. They may include factual information about other product ingredients. Marketing communications should not encourage non-smokers or nonnicotine-users to use e-cigarettes. people under 18, especially by reflecting or being associated with youth culture. They should not feature or portray real or fictitious characters who are likely to appeal particularly to people under 18. People shown using e-cigarettes or playing a significant role should not be shown behaving in an adolescent or juvenile manner. People shown using e-cigarettes or playing a significant role should neither be, nor seem to be, under 25. People under 25 may be shown in an incidental role but should be obviously not using e-cigarettes. Marketing communications should not be directed at people under 18 through the selection of media or the context in which they appear. No medium should be used to advertise e-cigarettes if more than 25% of its audience is under 18 years of age.